Posthaven launches post by email, and is self-sustaining with your support! It's here. 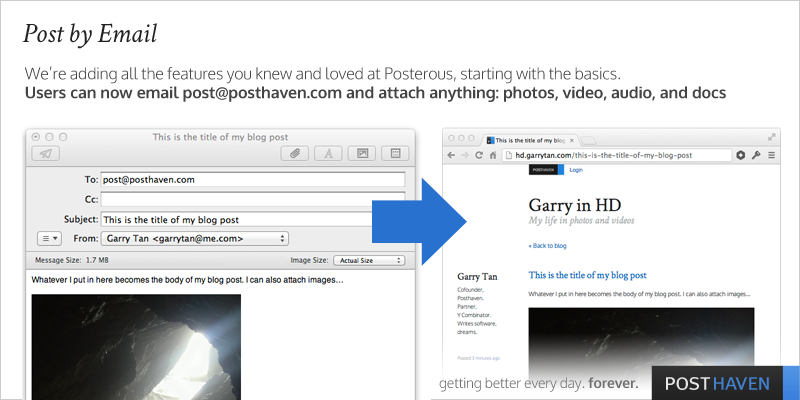 Now all Posthaven users can send email to post@posthaven.com and attach photos, video, audio, documents and files of any kind. We process it and turn into the blog post you've come to know and love. You can also combine the above flags by emailing twitter+nogallery@yoursite.posthaven.com, and that would post images with no gallery to yoursite.posthaven.com and also autopost it to twitter. We're also pleased to announce that Posthaven is now in the monthly paid period and has reached profitability! This means that no matter what, we'll be able to keep the servers online and keep working on making this the best possible place to post. We continue to focus on building new features, including all the things you've been asking for: multiple contributors, email subscriptions, and theme customization. Thanks for your support. Please spread the word! Stephen Daniels upvoted this post. Great to hear it's profitable - good news for us all! Justin Dorfman upvoted this post. Congrats Garry. Both great accomplishments. Thorsten Schulz upvoted this post. Good news, well done :o) It is exciting to see how things are going on. Wouldn´t this be the right time to change this dark and gloomy background picture of the welcome page? David Krauser upvoted this post. Matt Matrisciano upvoted this post. Yes, it's fantastic to hear Posthaven is self-sustaining! Vítor Barreto upvoted this post. Mia Helenius Lockner upvoted this post. Colin Kennedy upvoted this post. Ben Lucier upvoted this post. Amar Sood upvoted this post. Yannik Robin Kettenbach upvoted this post. As with most holidays, Mother’s Day comes only once a year. Make it special for her, and it will come back to you. There is something beyond words to express to the person who helped you to walk and talk, who gave you your first puppy, who helped you with school, and who gave you all the love she possibly could. 26 visitors upvoted this post. Easy, simple blogs for $5/mo, forever.